Nancy Friese, photo by Scott Lapham. Nancy Friese obtained her BS in nursing from the University of North Dakota, in the state where she was born and maintains a farmstead studio. She changed her career course and studied painting and printmaking at different venues, culminating in an MFA from the Yale University School of Art in 1980. 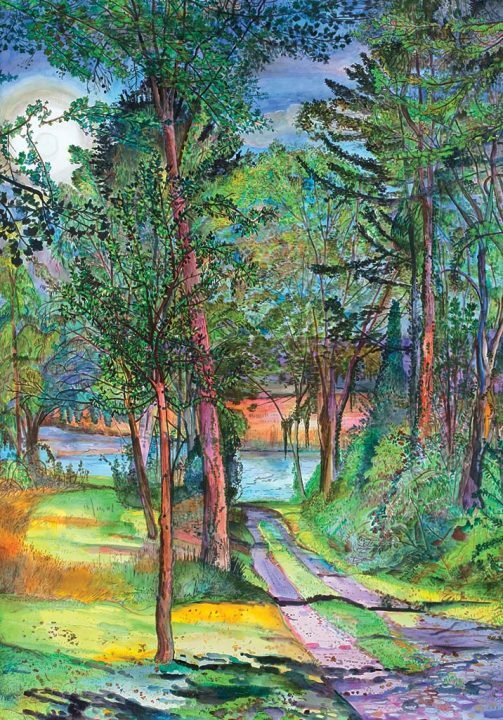 Primarily a landscape painter and printmaker, Friese is currently working in watercolor on large-scale landscapes. 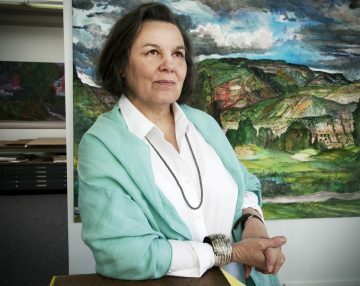 A recipient of numerous awards, fellowships and artist residencies, Friese has exhibited her paintings and prints nationally and internationally. She is a professor at the Rhode Island School of Design, where she has taught since 1990. Watercolor on Lanaquarelle, 85 x 60 in.